The Eclipse series is a fine example of where fly reels are heading built on the most advanced Teflon drag system available. Heavily ported machined aerospace aluminium frame and spool offering a super lightweight reel that runs as smooth as silk with silent retrieve and low-tone out going click. 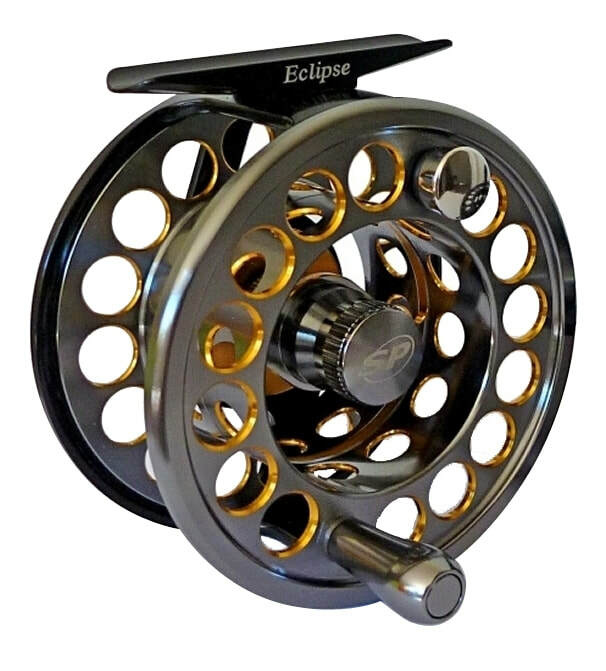 The Eclipse series align with modern fly reels built on preferred larger arbors currently moving toward a welcomed wider spool to accommodate maximum line capacity. Enhancing the advanced design is a high quality triple anodising finish that delivers alternative colouring in either traditional semi-gloss all black reel or black frame with gun metal/gold edged spool. Machined aluminium capped handles in matching colours complement the spools. Internal Drag covers on both reels are anodised gold and the laser etched logos complete the stunning presentation. The 2 colour combinations come in 3 sizes and extra spools are available. The perfectly balanced Eclipse series fly reels are equipped to handle all that is demanded of them in every fishing situation. The South Pacific Executive fly reel brings together the charm of a traditional style fly reel built on a modern design concept. The powerful modern Teflon disc drag is at the core of this quality designed reel that offers every modern specification without compromising the look and feel of a classic traditional fly reel. Extensively ported 100% aerospace aluminium machined frame and spool with palming rim in anti-corrosive triple anodised dark smoke finish and maple timber handle. Match the Executive to your treasured bamboo fly rod or your favourite graphite rod and experience the rewarding satisfaction of fishing with the Executive fly reel. In a world where ‘You get what you get what pay for’ it’s a pleasant surprise when you get a whole lot more than you expected. The South Pacific Advance large arbor fly reel is one of those products that delivers you far more than the dollars spent. This modern designed reel is built from machined bar stock aluminium, finished in a stunning twin-colour finish and has everything you expect in a high-end fly reel except the expensive price tag. Extensively ported frame and spool minimises weight and the serious FXB Polymer drag system has the Advance reel matching the build of serious high-end fly reels. The Gold/Gun-Metal anodised finish is enhanced with lazer etched logos. It’s a great time to Advance in your fly fishing equipement and best of all, you can do it without breaking the bank. The perfectly balanced Advance series fly reels are suitable for Fresh and Saltwater fishing. Constructed from New Generation Carbon Fibre Composite. Moving beyond common materials such as Cast Aluminium often used to produced economically priced fly reels , New Generation Carbon Fibre Composite has multi-directional strength properties that Cast Aluminium cannot match. 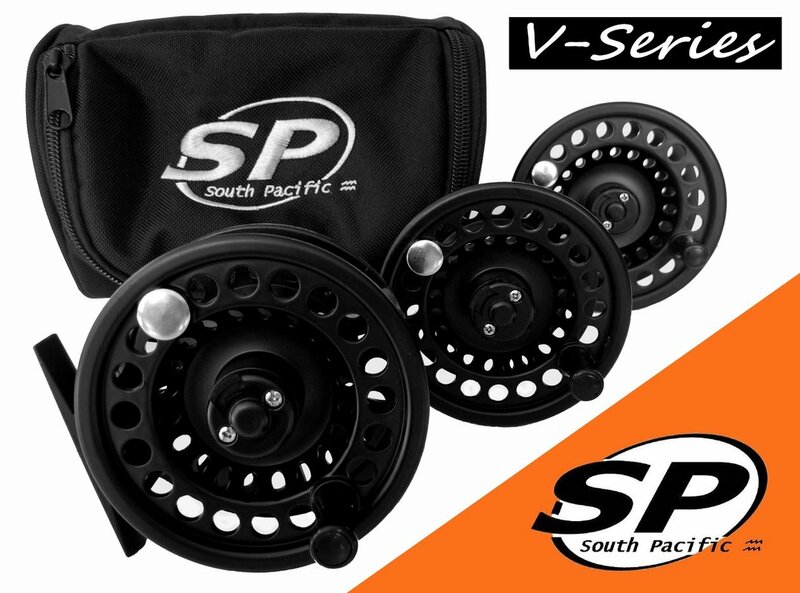 Eliminating any possibility of cracking or breaking, the South Pacific V-Series fly reel offers welcomed peace of mind to the fly angler. Lightweight advantages in ratio to extreme strength delivers a solid rigid frame and spool that cannot corrode, nor break or bend out of shape if accidently dropped on the hardest of surfaces. The remarkable break-through technology of New Generation Carbon Fibre Composite utilised in the South Pacific V-Series fly reel provides material properties never before available in such an economically priced modern fly reel. In addition to the V-Series’ great looks and low price, are numerous design features including a Serious Smooth Disc Drag System suitable for freshwater and saltwater fishing. V-Series Fly Reel + 2 Spare spools in a 3 Section Zippered 600-D Nylon Reel Bag with embroidered logo. Have your floating, Sinking and Sink-tip lines ready to go ! 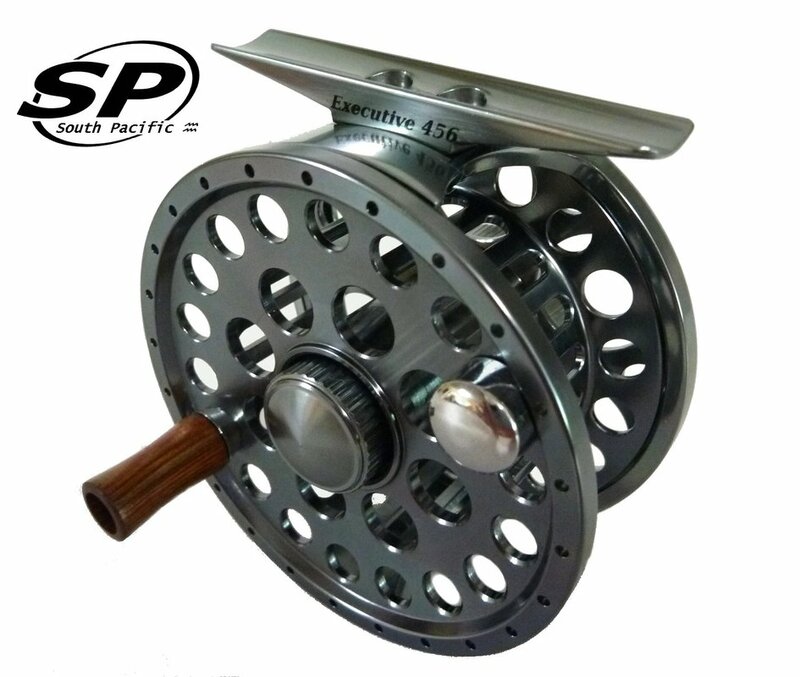 The SPEY LITE is a purpose designed machined aluminium spey fly reel built to accommodate all spey rods & all modern spey lines including Sakgit style spey lines. In the past, spey anglers had to often settle for the largest sizes of standard fly reels but now the SP SPEY LITE being a purpose built large capacity spey reel offers a specific equipment choice to service the spey angler. 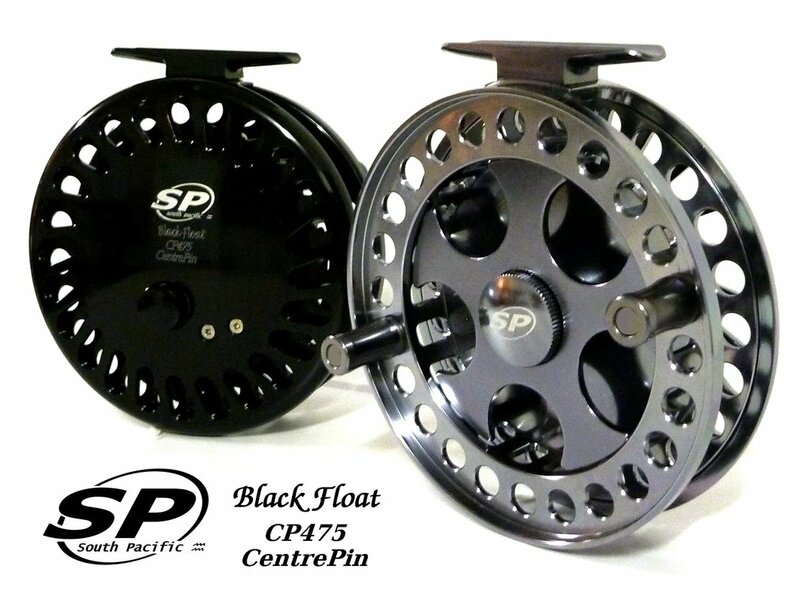 The Black Float CP475 CentrePin is a premier float style reel that stands alongside the best center pin reels produced worldwide. Precision 100% aerospace bar stock aluminum frame standing 4.75" with 4.5" diameter spool available in Dark-Gunmetal or Classic Black. Finished in a high-grade triple anodised salt-resistant coating with full stainless steel componentry throughout. This beautifully balanced reel runs extremely long and smooth on twin sealed bearings with very little resistance allowing easy line-feed when fishing or casting. The spool's soft inside-edged palming rim offers very sensitive operation and the knurled-edged clicker knob at the rear engages a line-feed alert that doubles as fine back pressure if required. The spool is easily removed by a quick spin of the centre-spool nut. No matter whether you're a hardened blackfish angler, Steelhead & Salmon diehard or a Carp & Catfish moocher the SP Black Float 475CP equips you with the best in modern centre pin reels available.